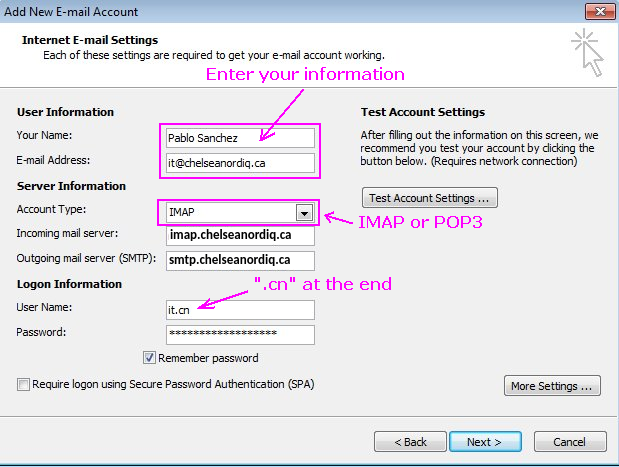 1 Which Should I use IMAP or POP3? 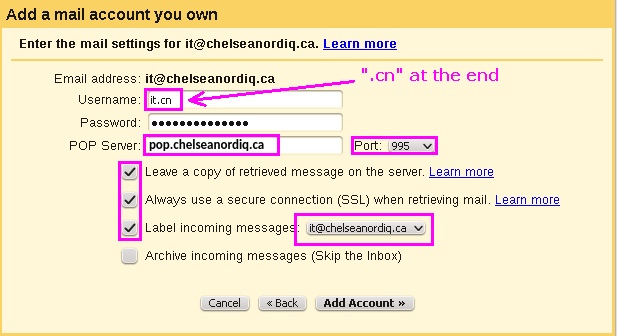 All email protocols are secured in order to safely send and receive Chelsea Nordiq email in public Wi-Fi locations. 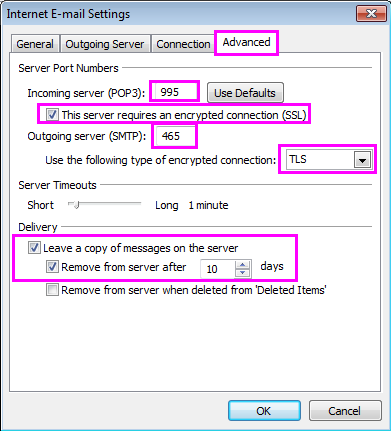 Which Should I use IMAP or POP3? It's strongly recommended to always use IMAP. 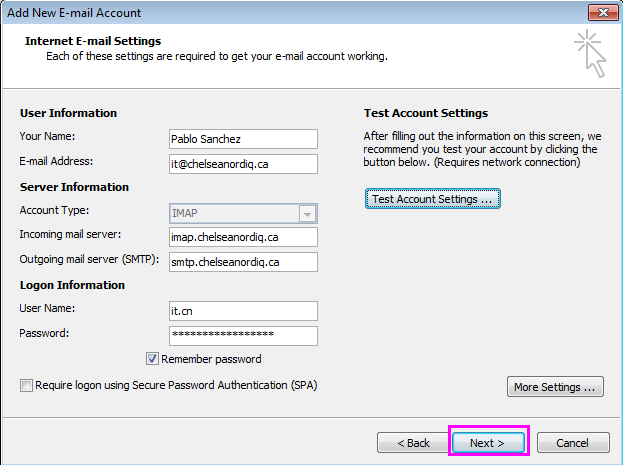 IMAP keeps the email on the email server so if you have more than one email clients (e.g. your desktop and a Smartdevice), they can stay synchronized. 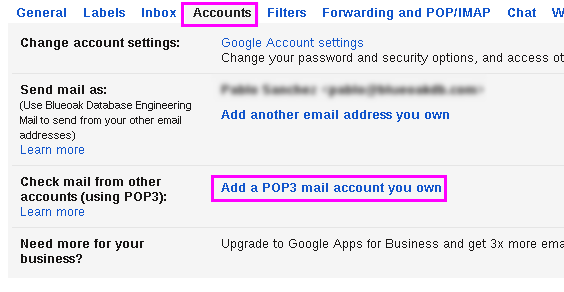 POP3 is also available and not recommended as once the email is typically fetched, it's removed from the email server. 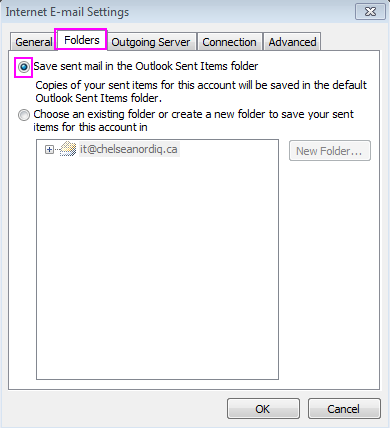 It's recommended that Chelsea Nordiq email not be forwarded to your personal or business email. This way responses will have an @chelseanordiq.ca domain name. 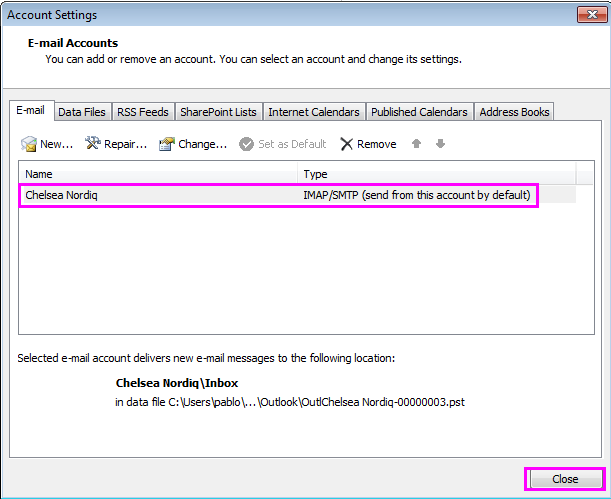 See the Setup Examples below on how to configure gmail or Outlook to send and receive Chelsea Nordiq email. 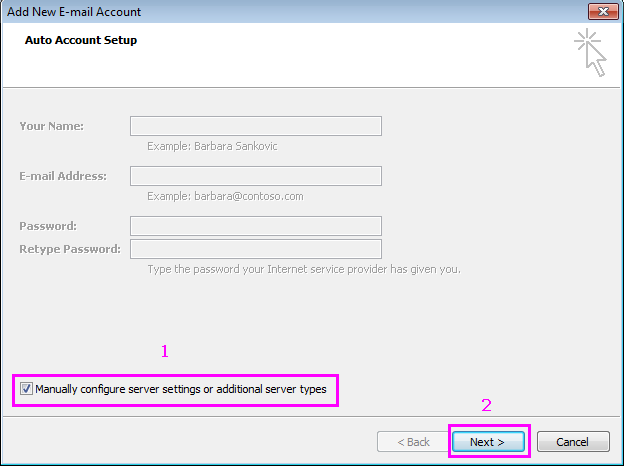 Any email client can be configured. Whether it's a Smart Device or a regular client. 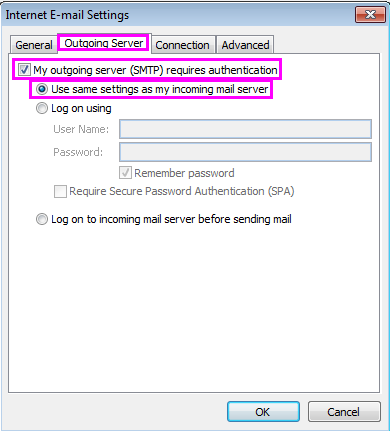 The email login/user name is your email name + ".cn"
It is imperative to use encryption otherwise if in a cafe, your credentials can easily be snooped. 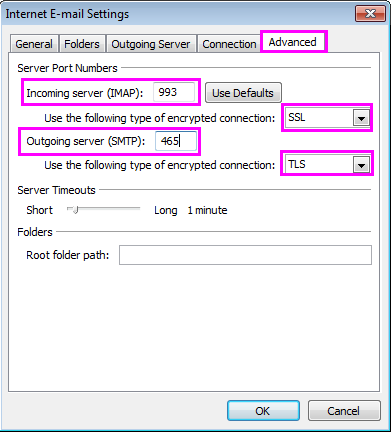 Try SSL and if it does not work, try STARTTLS. 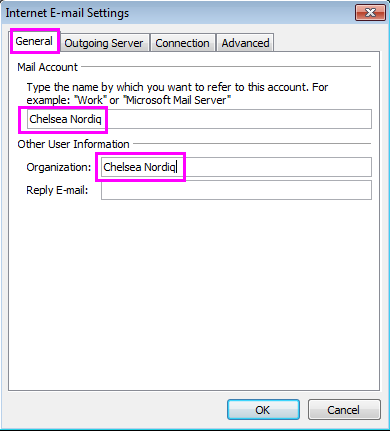 Below are examples setting up an email client using the it Chelsea Nordiq email address. Enter your Username along with the other information below. 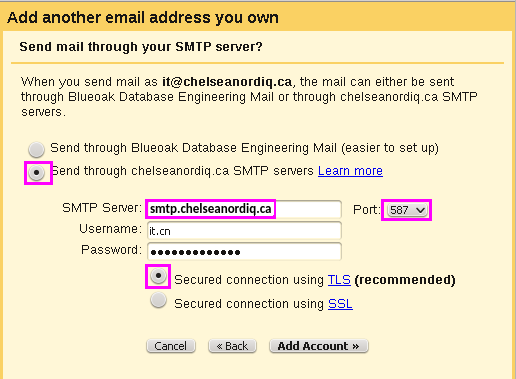 Your Username does not have @chelseanordiq.ca at the end. 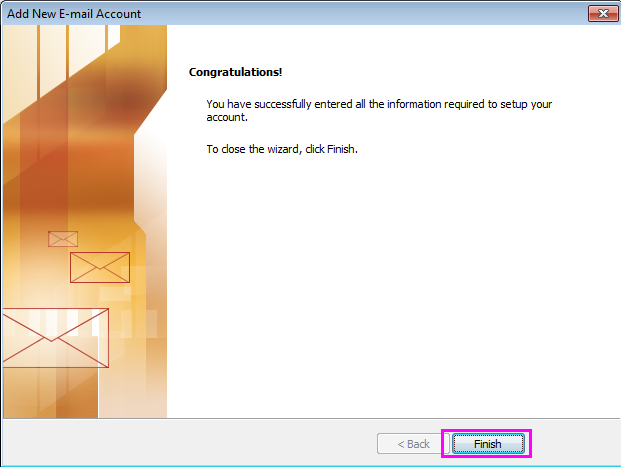 A confirmation email message is sent to your primary gmail account. Open a new browser (or tab) to retrieve the verification code. Or click the link in the verification email. 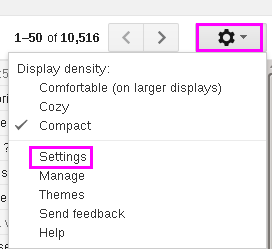 After verification (or closing the window), in the Accounts, check button below. 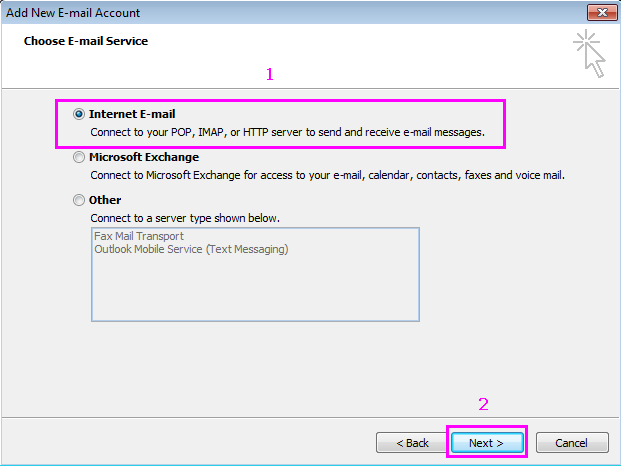 Below is a detailed example on how to set up Outlook 2007. Select the Account Type as either IMAP (recommended) or POP3. Notice the user name ends with . Enter the following information in the General tab. 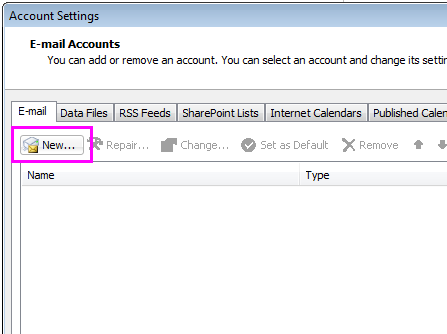 Note: If you've selected IMAP, you will see an additional tab, its default settings are sufficient. Note the new account. 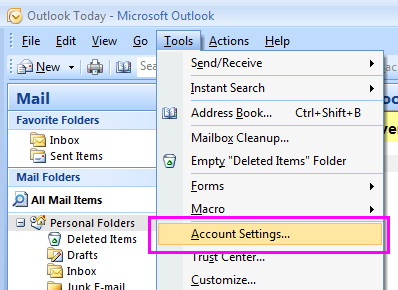 Click Close to close the Account Settings window and return to the main Outlook window. You're done.